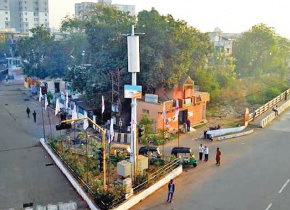 Vadodara Municipal Corporation in partnership with Indus owers, one of the world’s largest telecom tower company has announced successful deployment of 50 intelligent smart poles in the City. The poles will have provision for public Wi-Fi, Smart Bill boards, CCTV cameras and environmental censors. Wi-Fi will be available to the citizens through these hotspots. As many as 220 intelligent and connected poles are planned to be deployed by Indus Towers over the next two years in Vadodara. The intelligent smart poles will be integrated with Command and Control Center so that messages on the Variable Messaging Boards can be released simultaneously at all the locations. All the Intelligent poles and telecom poles are connected through fiber for current and future requirement of communication. The poles enable installation of 4G technology, meeting the requirements of the City and provide high performance broadband to meet the network requirements thus ensuring seamless connectivity. Along with intelligent poles, a citizen’s mobile application developed by Vadodara Smart City Development Limited is also launched.